As most of you know, Google gives Android away for free to handset OEMs. The combination of rapidly updating Android and not charging licensing fees has resulted in a staggering rate of growth for smartphones powered by the little green robot. Which is good for consumers, but it’s less clear what Google hopes to get out of it. Speaking at Le Web, Marissa Mayer, Google’s VP in charge of local products, explained some of the benefits Google gets from creating such a successful mobile OS. Android of course helps promote Google’s current business: Search. Android phones haven’t been required to come with Google’s search engine installed as the default, but customers have shown a strong preference for it, and mobile search is growing faster than desktop search. According to Mayer, Android also allows Google to promote its apps, and more easily add new features to them. Gmail and Google Maps can be updated more easily, as Google can access any part of the OS to implement a new feature. Google Maps is particularly important to Mayer, as location-based data and services are behind many of the initiatives she oversees, including their Groupon-like local offers business. Google Maps 6 introduced a new feature that will be particularly important – interior maps of malls, airports, and other “public” buildings. As useful as it is to find your way around an airport that you’ve never visited before, it’s also useful (and profitable) for local business to be able to offer coupons to customers that are already in a mall. 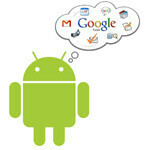 So Google may not make money from Android the same way that Microsoft or Apple do from their mobile OSes, but by being able to control development and promote their apps Google can leverage Android to drive their current business (like search and YouTube) and creates new business opportunities, like the local offerings that Mayer’s group is working on. I am very happy that google is making all this possible. Because of google many Asian companies and growing and earning more money than google. In fact google is indirectly taking money and power away from American ( Apple, Motorola , RIM etc) and European ( Nokia etc) countries and giving it Eastern countries. One day google head quarters will be in either Shanghai or Seoul. Thank you GooGle! This is a great way to promote and make money. Since android keeps growing at a huge rapid rate, it helps get more phones and devices into the hands of people , in return helps google make a profit using their services and make money from the apps and games they have in the Android Market. You contradict yourself. The article you posted is about developers making money not Google or Android. This reminds me of facebook. At first they didnt have ads because they didnt want it to ruin their growth and thats the same thing google is doing by not charging for the OS.